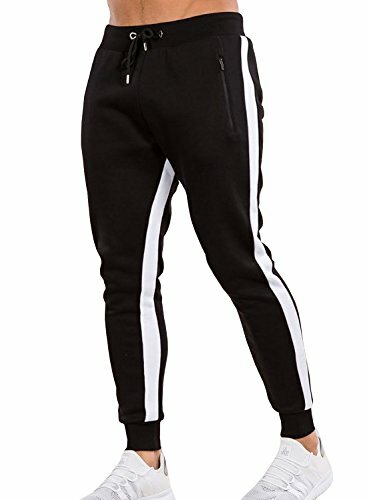 Ouber Men's Gym Jogger Pants Slim Fit Workout Running Sweatpants with Zipper Pockets (L,Black) by Ouber at Common Wealth. Hurry! Limited time offer. Offer valid only while supplies last. • The elastic waistband and cuffs, makes wearing these pants a breeze while also providing a snug and secure fit along with the waist drawstring. • The elastic waistband and cuffs, makes wearing these pants a breeze while also providing a snug and secure fit along with the waist drawstring. • Built with high quality cotton and elastane, the pants breathable and lightweight enough to use on a warm summer day, but also warm enough to wear on chilly nights. • The joggers are constructed with a slim fit finish and tapers through the legs for a naturally slimming effect. • Perfect for any casual activity: lounging at home, going out, casual everyday wear, walking at the beach. Suitable for gym, leisure, homewear, outdoor, sports like jogging, bodybuilding, yoga, dancing and much more. If you have any questions about this product by Ouber, contact us by completing and submitting the form below. If you are looking for a specif part number, please include it with your message.